Andy H: The pull-list is a bit quieter this week but still a few good titles to look forward to. 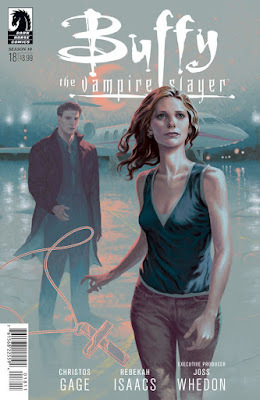 You can't keep a good slayer down and I have to say I've really enjoyed the Buffy The Vampire Slayer Season 10. Over the past few issues most of the Scoobies have slowly been drawn together and now Angel has joined the fray. Friction can't be far away with Spike in the mix. Christos Gage and Rebekah Isaacs have caught the 'voices' of the characters perfectly and as a fan of the TV series this has been a great way for the gang to live on. BOOM! Studios have had some decent hits on their hands over the years and Hexed is one of them. It possibly slipped under the radar for most but its been a great series. Hexed #12 is the final issue and what started, for me, as a supernatural heist title has evolved into so much more, so all praise to Michael Alan Nelson for his top notch writing. Amazing Spider-Man: Renew Your Vows has been a hit for me. Peter, Mary-Jane and daughter Annie have had to keep a low profile and avoid the attentions of Regent. Obviously that hasn't happened and now the Sinister Six are on their trail. Will Pete be able to protect his family and will Annie join the fight? Issue #4 will hopefully have the answers courtesy of Dan Slott and Adam Kubert. From Image I'll be grabbing the all equally excellent Birthright #10, Manifest Destiny #16 and Trees #12 and to top it all off, there's the wonderful Giant Days #6 also from BOOM! Studios. Stewart R: How quickly time flies; it seemed like only yesterday that I was previewing Welcome Back #1 back in our August Ten Forward piece and here we are with it about to hit shelves. I'm still excited about the premise of an ongoing war that's taking place between two sides, who fight it out via the process of resurrection. The preview art certainly seems to solidify the promise and I'm looking forward to getting my hands on the finished product. Over at Valiant it's time to reach the halfway point of the Book Of Death storyline - bless these four-part events - with the second issue, where I'm guessing everything will take a turn for the crazy following a slightly formulaic opener which moved everyone into place and set up the premise. Valiant are certainly doing a fine job of using their canon with sharp focus and precision and I've been impressed with how these mini-events have been varied in story and remained dramatic and intriguing. I'll wrap things up with a #3 to maintain a 1, 2, 3 structure with this week's On The Pull and that leaves me to wave Weirdworld #3 in your faces good people! It's a Marvel 'Battleworld'/Secret Wars book in the very loosest of senses as there's been little to no mention of the wider event through the two issues released so far. Arkon has found himself on this strange and deadly continent and simply seeks to find his way out of it in one piece. The art is just sumptuous, as is to be expected with a Mike Del Mundo book, and if you're in the mood for a beautiful fantasy adventure miniseries to see you through the summer, you should be looking in Weirdworld's direction.